Leading connected toy provider moving beyond voice communication into education, entertainment and interaction. Toymail, the innovative connected toy company, today announced the launch of their new cloud-based subscription service to make their Talkies a more integral part of keeping families and their children connected. Expanding on their current 2-way talk over WiFi capabilities, Talkies are now smarter, more fun, and educational. Seeking to enhance and strengthen the bond between kids and their families, Talkies were launched in 2016, and have already driven increased family interaction, as children are communicating with loved ones over three times per day through the toys. This new cloud service will further advance these interactions, continuing Toymail’s ascension as a leading player in the connected toy space. The platform will soon promote language learning, reading comprehension, spelling, pronunciation and more. Establishing the first “social network for kids,” Talkies are also the only toy where kids can communicate with their friends independently. Voice Changer – more fun than your actual voice! “Parents are busy, and needed a way to communicate with their kids when they can’t be there in person,” said Gauri Nanda, co-founder and CEO of Toymail. “These new services help fulfill on our promise to parents that Talkies not only help them communicate, but they provide more fun, more learning and more time away from screens.” Nanda had previously described some of the features during her February appearance on ABC’s Shark Tank, where she landed a record-breaking deal. In addition to the cloud services, Toymail today announced their rollout into nationwide retail distribution at Best Buy and Target. With these retailers, Talkie characters will now be available nationwide in nearly 4,000 retail locations and online. After successfully testing the products earlier this year in a subsegment of their stores, both retailers have opted to bring Toymail Talkies into full chain distribution. A cornerstone of Toymail's mission is to keep kids engaged. The number one thing parents want is toys with a "lasting factor." This is not surprising, given that kids will play with a toy for an average of 6 hours before tiring of it. Toymail has proven that they can get children to come back to their toys multiple times throughout the day, to get new content. This engagement is already impressive, and Toymail will continue to build on this with new services, new features and new industry-leading connected toys. Crowdfunded in 2013 and featured on ABC’s Shark Tank, Toymail is an award-winning platform that revolutionizes the way children communicate and connect throughout the day, while keeping them off-screen. Toymail’s groundbreaking technology is simple and kid-safe, fusing physical play in a digital environment and strengthening connections with loved ones. 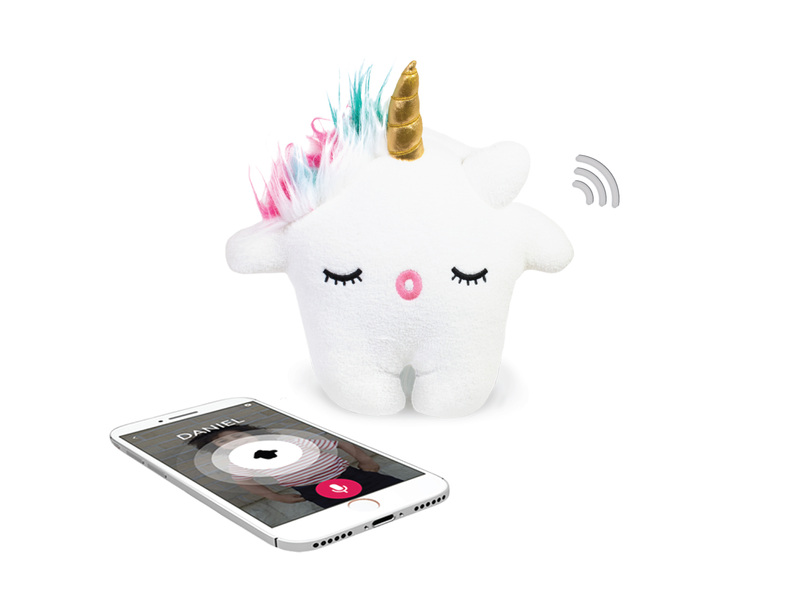 Talkies by Toymail Chat with your kids. Your app, their toy.